On the ceiling of a niche dug out from the upper wall of a gallery for a venerated tomb one sees the Good Shepherd, a symbol of Christ amid trees with stucco trunks with painted branches bearing red and green flowers. At the far right there is a very evocative image of the Madonna and Child with a prophet in a tunic and pallium pointing to a star considered an allusion to the prophecy of Balaam: "A star shall come forth out of Jacob, and a sceptre shall rise out of Israel" (Num 24:15-17). 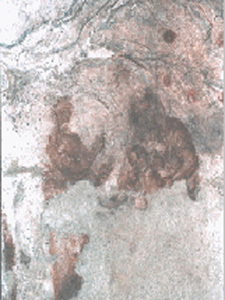 The style of the fresco and its location (in one of the oldest areas of the cemetery) contribute in dating the image to the beginning of the third century A.D. making it the oldest known image of the Mother of God.